The first tremors of a political earthquake hit Europe. 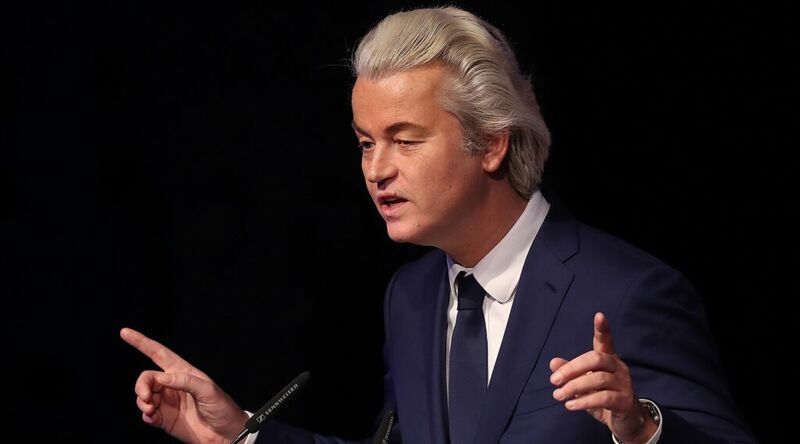 Dutch politician Geert Wilders, hair slicked back and rhetoric at the ready, has said the coming March 15 election in the Netherlands is the start of a “patriotic spring” across Europe. After the Dutch elections, in which Wilders’s Party for Freedom (pvv) is predicted to pick up the largest number of seats, the French will vote in May, the Germans in September, and the Italians whenever they get around to it. Wilders has risen in popularity over the past decade. In 2008, his anti-Islam Fitna video put him on the international stage, and the subsequent death threats and assassination attempts failed to cage him. Across Europe, to differing degrees, this is what has happened. France’s mainstream parties have collapsed, leaving the campaigning to former outsiders. Austria only narrowly avoided electing the previously “unthinkable.” Germany’s AfD is ripping votes from the grand coalition. And Geert Wilders, or “Captain Peroxide,” has the incumbent government changing its tune to avoid irrelevance. “There’s something wrong with our country” began an open letter to the Dutch people published last month. It went on to moan about those who “abuse our country’s freedom to cause havoc, when they came to our country precisely for that freedom” and warned them to “act normal or leave.” The author was not Geert Wilders, leader of the anti-Muslim Freedom Party (pvv), but Mark Rutte, leader of the free-thinking Liberals (vvd) and prime minister of a country that presents itself as one of the most tolerant in the world. “Act normal” (doe normaal) is a common injunction in Dutch; it can mean “Don’t be obnoxious” or “Don’t be silly.” But here it had a dark, exclusionary ring. This is not the only instance of Rutte stealing words from Wilders. Earlier in the political season, Rutte told antisocial Turkish youths to “pleur op” or “piss off” back to Turkey. “Everybody knows immediately this is Wilders’ style … it’s almost a dialect word, a little bit archaic,” said Henk te Velde, a professor of Dutch history at Leiden University who studies political language. Previously Europe’s modus operandi has been to brand the outsiders as “racists,” or even better still, “fascists.” When that approach loses its sting, it’s time to bridge the ideological gap. As Germany’s Edmund Stoiber would say, you can’t let another party address the concerns of your conservative citizens. Yet even with the Netherlands’ highest poll ratings, it’s still unlikely that Wilders will clinch the top job. The other parties will do all they can to prevent it. The pvv is expected to get 20 percent of the popular vote, with Rutte’s vvd predicted at around 16 percent. The Netherlands’ constitution requires a simple majority in order to govern. Many parties have refused, in advance, to join any coalition with Wilders. If Wilders wins the greatest number of votes—and doesn’t receive the equivalent power—you can imagine the outrage. This seems the most likely outcome—Wilders gets the most votes, is excluded from power, and therefore sees his popularity soar even higher. Is that unthinkable? These parties are already coming close to being a part of national and regional governments! Their ideas are becoming mainstream. The rise of Wilders and others like him points to a radical shift in politics across all of Europe. The entire political spectrum is shifting to the right. This shift certainly addresses real problems that Europe faces. But the less savory elements of this movement point to the dangers here.